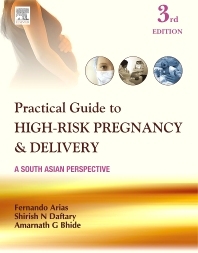 The third edition of the book, Practical Guide to High-Risk Pregnancy and Delivery, has been completely revised to present more up-to-date approach to the field. Several changes have been made in the book to keep up with multiple new developments and to facilitate the finding of information. However, the purpose of the book remains unchanged: to provide residents in Obstetrics and Gynecology, fellows in Maternal–Fetal Medicine, obstetricians, general physicians, and interested nurses and medical students with a source of practical information about complications of pregnancy. Important points at the end of every chapter help in quick recapitulation. Separate chapters on Hypertensive Disorders in Pregnancy, Diabetes and Pregnancy, and Cardiac Diseases in Pregnancy. Separate chapter on Tropical Diseases in Pregnancy has been added keeping in mind Indian conditions. Data of relevance to India has been added at relevant places in all the chapters. Sir Dr. S Arulkumaran is Professor and Head of Obstetrics and Gynaecology at St George’s University of London. Previously the Secretary General and Treasurer to the International Federation of Obstetrics and Gynaecology for nine years, he is now President-Elect for the federation. Sir S Arulkumaran is the past President of the Royal College of Obstetricians and Gynaecologists of the UK from 2007 and 2010. He is Editor-in-Chief of Best Practice and Research in Clinical Obstetrics and Gynaecology and author of 245 indexed publications, 24 books and 164 book chapters. He is the Honorary Fellow of the America, Sri Lankan, South African, Pakistan, Indian, Australian and New Zealand Colleges of Obstetrics and Gynaecology and the Honorary Member of the Canadian, Malaysian, German, Italian and South African Societies. Sir S Arulkumaran was knighted as Knight Bachelor in the Queen’s Birthday Honours List in June 2009 in recognition of Services to Medicine. Dr. Kaizad Damania is currently working as consultant, Obstetrics and Gynaecology at N Wadia Maternity Hospital, Mumbai. Professor Emeritus and Consultant, Obstetrician & Gynecologist, Nowrosjee Wadia Maternity Hospital, Mumbai. Dr. Daftary’s Total Care Clinic, Mumbai.